The below is from the H.Q. Tobruch Fortress Intelligence Summary No. 10, issued on 1 November 1941. The Polish Officer missing from a patrol night 30/31 Oct has returned. A full report has not been received. It seems that he posed as a GERMAN, and having previously bandaged his head, hailed a passing lorry and ordered the ITALIAN driver to take him to the hospital. During the day he took cover in a gun pit near the DERNA rd and spent the day observing. At dusk he returned by lorry, this time driven by a LIBYAN, and debussing in the MEDAUUAR, made his way successfully through to our lines. Details of the information gained will be given when available. The report is contained in the next day’s intel summary No. 11, 2 November 1941, although it appears to me that the officer wasn’t Polish after all, going by the surname. A report has been received of the activities of 2/Lieut. RUSHILL who, as mentioned in yesterday’s summary, penetrated the ITALIAN lines on the night 30/31 Oct.
Whilst concealed in an arty pit near the DERNA Rd, he noted a considerable amount of movement West to East. He located 4 fd guns at 394433 on the left of the road, and 2 fd guns on the escarpment at about 39504315. He also noticed about 8 tanks dispersed near the escarpment. The locations are about 10 km NNE of Acroma, within the Axis bypass road perimeter. In previous posts I have provided information on German (at this link) and Italian (at this link) tank deliveries to North Africa. At the request of David, here’s an overview of tank reinforcements sent to Egypt. It is broken down by convoy, except for the US deliveries, for which this information is not available. Here instead I have used the closest report to month end (they were issued weekly to the Prime Minister), taken the ‘in theatre’ number for that report, and substracted the ‘in theatre’ number for the previous month-end report. So e.g. for end July 40 M3 Light are reported ‘in theatre’, while for end August 109 are reported. August deliveries are therefore 69. It’s not perfect, but in the absence of convoy information it’s the best I can do. I hope readers find this useful. What is shocking however is to compare the number of deliveries with the number of tanks operational on 7 February, in this older post, and that is where it becomes clear why this high level of deliveries was desparately needed to stay in the game in North Africa. With 1,184 tanks delivered, and another 356 on hand, substracting the 100 that had been sent to Burma with 7 Armoured Brigade, but adding another 66 M3 Medium that had arrived in the interim, leaves a total of 1,506. Yet on 7 February only 350 were operational, i.e. less than had been operational on 2 July 1941, while another 893 were estimated to undergo repairs and maintenance, and 36 M3 Light were with 10 Armoured Division in Palestine, making for an estimated total of 1,279. This implies 227 total losses, but this was quickly revised upwards, to an estimate of 390 (180 Crusader (sic! ), 130 M3 Light, 80 I-tanks). I believe to these losses have to be added the losses of 7 Armoured Brigade and 1 R.T.R., which were equipped with older Cruiser marks, and this would increase losses by another up to 150. By 9 February GHQ M.E. had decided that older Cruiser marks were no longer considered for the tank strength return, since they had become obsolete and/or so worn out not to matter anymore on the battlefield. Total losses of about 540 cruiser and I-tanks sounds believable to me. In terms of types, I would guess about half of the UK I-tank deliveries would have been Matilda II, the other half Valentines. For the British cruisers, most if not all of them would have been Crusaders, I would guess. 2 Includes 4 M2A4, mentioned here for completeness. 5 AA tanks with Besa Quad MG mounts, belonging to 1 Armoured Division, but lent out on arrival to 1 Army Tank Brigade. 6 Number in brackets are M3 Medium tanks received in theatre during the month. Where are the 120 odd [tanks] which were to have arrived on the 8th [July], and where are the rest of the first 60 Americans? Why did the Minister of State say the other day “We have only 100 tanks fit for action” when you show 211? Are these figures telegraphed from Cairo, or do you make them up here, or do the War Office. My friend Cedric has been considerably more productive than I have been, and has put out two books in the last year and a half. I am afraid they are in French, but if you speak French, they are bound to be chock full of information and pictures (or in the case of the biography, maps) you have probably never seen. I haven’t read them, but going by the quality of his articles/special issues in Batailles & Blindes, they are must haves. 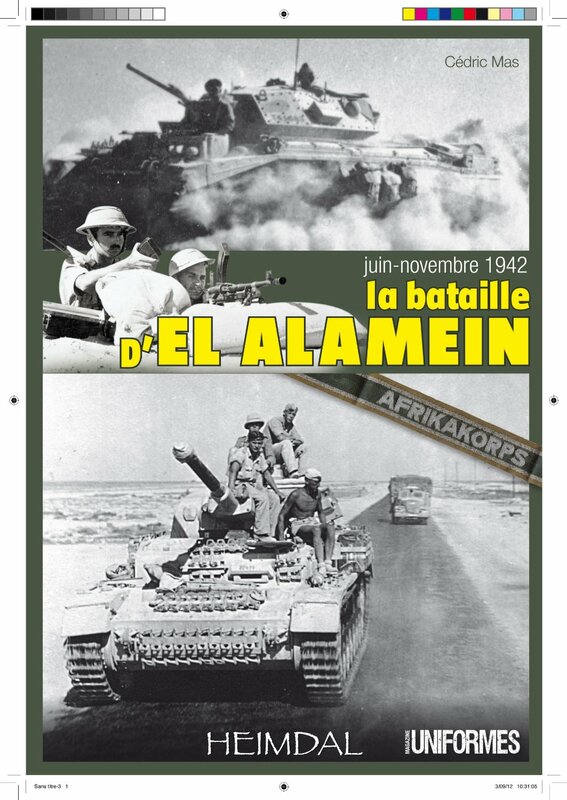 Of the special issues of Cedric, the first one is still available at this link, while the second one is sold out, as are the regular numbers 31 & 32, which contain a two-set article on the German artillery in North Africa.